User entry. Where applicable, this should match the tags that are used on the plans. Chillers are only designated when the baseline system is of type 7 (VAV with reheat) or 8 (VAV with PFP Boxes) (see Table G3.1.1B). The type of chiller, either a vapor-compression chiller or an absorption chiller. Double Effect Absorption – use two generators/concentrators and condensers, one at a lower temperature and the other at a higher temperature. It is more efficient than the single effect, but it must use a higher temperature heat source. The number of identical units for staging. As designed. Default is 1. From [bookref id="type-and-number-of-chillers"] above, there is one chiller if the cooling load is 300 tons or less and two equally sized chillers for loads between 300 and 600 tons. For loads above 600 tons, two or more chillers of equal size are used, with no chiller larger than 800 tons. The cooling capacity of a piece of heating equipment at rated conditions. As designed. If unmet load hours are greater than 300, the chiller may have to be made larger. Determine loads for baseline building and oversize by 15%. The Coefficient of Performance (COP) at ARI rated conditions. With the ASHRAE Standard 90.1-2007 baseline, use the minimum values of efficiency from either Table 6.8.1C for various types of chillers or the values from Tables 6.8.1H, 6.8.1I or 6.8.1J for centrifugal chillers. With the ASHRAE Standard 90.1-2001 baseline, use the minimum values of efficiency from either Table 6.2.1C for various types of chillers, or the values from Tables 6.2.1H, 6. 2.1I or 6. 2.1J for centrifugal chillers. The minimum unloading capacity of a chiller expressed as a fraction of the rated capacity. Below this level the chiller must cycle to meet the load. As designed. If the user does not employ the default values, supporting documentation is required. User may input curves, other appropriate functions, or use default curves. If the default curves are overridden, supporting documentation is required. Note: If an air-cooled chiller employs an evaporative condenser, todb is the effective dry-bulb temperature of the air leaving the evaporative cooling unit. User may input curves or use default curves. If defaults are overridden, supporting documentation is required. The default curves for engine driven chillers are the same format as those for the Steam-Driven Single and Double Effect Absorption Chillers but there are three sets of curves for different ranges of operation based on the engine speed. The baseline chilled water supply temperature is set to 44°F. The baseline chilled water return temperature is set to 56°F. The reset schedule for the chilled water supply temperature. The chilled water setpoint may be reset based on demand or outdoor air temperature. As designed. The default is [bookref id="chilled-water-supply-temperature-reset-schedule"]. The baseline chilled water supply temperature is reset from 44°F to 54°F based on outdoor air temperature as shown in the figure below. Air-cooled chillers use air to cool the condenser coils. Water-cooled chillers use cold water to cool the condenser and additionally need either a cooling tower or a local source of cold water. Evaporatively-cooled chillers are similar to air-cooled chillers, except they use a water mist to cool the condenser coil which makes them more efficient. The baseline chiller is always assumed to have a water-cooled condenser, although the chiller type will change depending on the design capacity. If the chiller size is less than 600 tons, the baseline chiller is a water-cooled screw; if the capacity is greater than or equal to 600 tons, the baseline chiller is a water-cooled centrifugal chiller. The energy usage of the condenser fan(s) at design conditions on an air-cooled chiller. This unit should only be used for chillers composed of separate evaporator and condenser sections where the fan energy is not part of the chiller COP. As designed. The user must enter data for remote air-cooled condensing units. Not applicable, since all baseline chillers have water-cooled condensers. With the ASHRAE Standard 90.1-2007 baseline, use the minimum values of efficiency from either Table 6.8.1C for various types of chillers or the values from Tables 6.8.1H, 6.8.1I or 6.8.1J for centrifugal chillers. From Table 7.8.2-1 above, there is one chiller if the cooling load is 300 tons or less and two equally sized chillers for loads between 300 and 600 tons. For loads above 600 tons, two or more chillers of equal size are used, with no chiller larger than 800 tons. As designed. The default is Figure 6.8.2-1. Baseline HVAC systems 7, 8, 11, 12, and 13 have chillers. There is one chiller if the cooling load is 300 tons or less and two equally sized chillers for loads between 300 and 600 tons. For loads above 600 tons, two or more chillers of equal size are used, with no chiller larger than 800 tons. See Table 3.8.2-1. Chillers are also rated at part load conditions known as IPLV (integrated part load value). 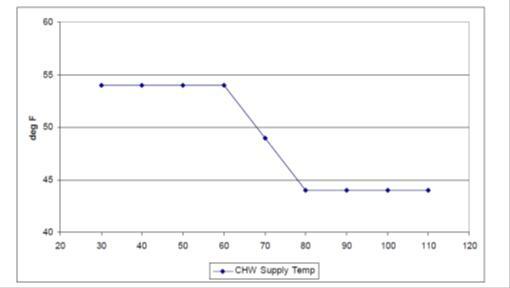 The IPLV is the weighted average of the chiller efficiency at 100%, 75%, 50% and 25%. The corresponding weights for these part-load conditions are are 17%, 39%, 33%, and 11%. The baseline HVAC chiller will be either a screw or centrifugal. Use the defaults for these chiller types from the above table: 15% for screw and 10% for centrifugal. Use default equations and coefficients for the baseline chillers..
Use default equations and coefficients for the baseline HVAC chillers. Not applicable. The baseline HVAC system has electric chillers. The method by which the chilled water setpoint temperature is reset. The chilled water setpoint may be reset based on demand or outdoor air temperature. The baseline chilled water supply temperature reset uses the defaults. However, if the baseline chilled-water system serves a computer room HVAC system, the supply chilled-water temperature shall be reset higher based on the HVAC system requiring the most cooling; i.e., the chilled-water setpoint is reset higher until one cooling coil valve is nearly wide open. The maximum reset chilled-water supply temperature shall be 54°F. Temperature reset is not required for systems served by purchased chilled water. The baseline chiller is always assumed to have a water-cooled condenser, although the chiller type will change depending on the design capacity. All chillers with air-cooled condensers where fan energy is not part of the COP.